There's basically two disciplines: one is jewellery, and the other one is fibre, which is what I took. That's everything from embroidery, sewing, clothing, weaving, knitting… everything that has to do with creating fabric. Did you go straight into that program after graduating high school? I went to OCAD right after high school, but I actually took Illustration because a lot of my friends were taking it. It was kind of like, okay, I'll do it too! [Laughs] I got into Illustration and found that I didn't have the same goals as my friends who wanted to become illustrators and work on comics or magazines. I just didn't see myself in that. [Laughs] But yeah, I was there for 6 years. The program isn't that long, but I ended up spacing everything out. I was in Illustration for a year, finished all of my courses within four years except thesis, and then focused on my thesis for a year. What was the first thing that you worked on after graduating? Was it Contrabotanic? That actually came along while I was at OCAD. I think it was between my second and third year. I did this program called Summer Company, which is a government funded program that funds student's business ideas. It was something that my friends suggested to me because I wasn't taking any courses at the time and I wasn't working. I was like, "Okay, I can do this for the summer and it'll be a good resume booster." We had to submit a business idea and mine was the plants. 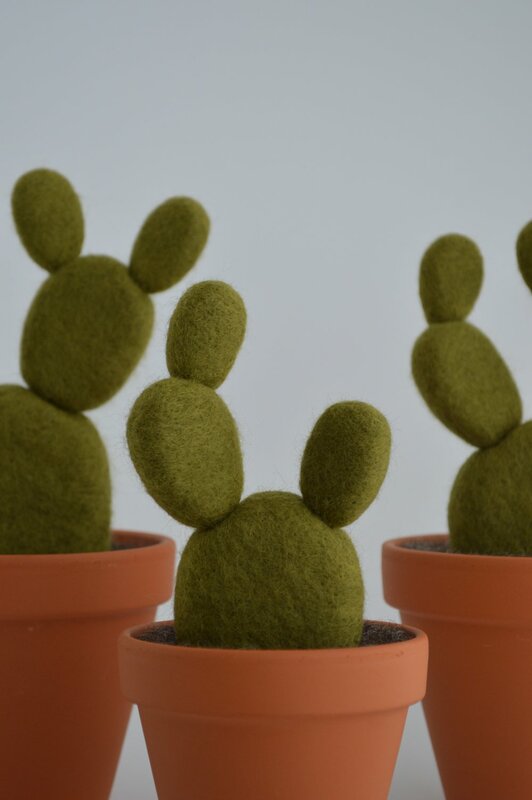 I learned quite a bit of those techniques like manipulating materials, needle felting... And I actually made the first version of the plants for a project. I made this felt terrarium so it was basically a bunch of plants together. People responded very well to it and told me that if it would be very cool if it was in individual little pots. I didn't think too much about it, but it was something that came to me when I was trying to come up with a business idea for the Summer Company. I figured that it's easy to do at home. It's pretty portable and you don't need a lot of materials for it. I feel like for Summer Company, I would've liked to do something that required more of the equipment that we had at school, like, screenprinting, sewing, and all that stuff. 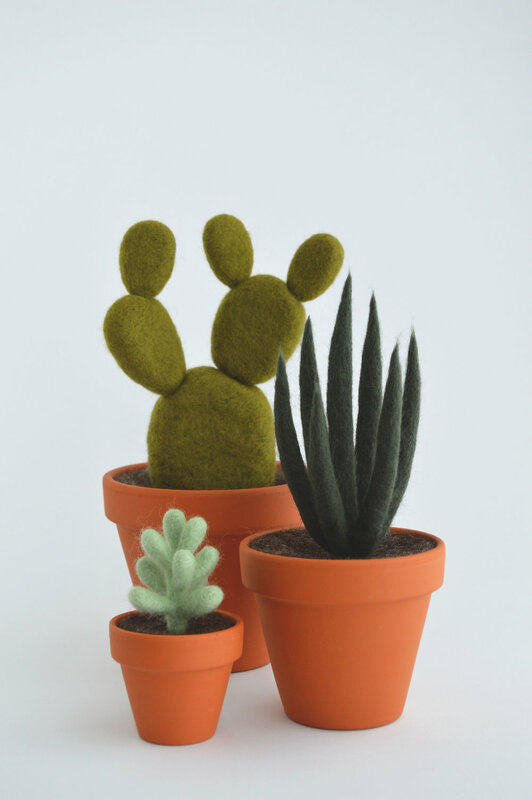 But I didn't have access to that in the summer, so that's why I went with needle felting because it's super simple. 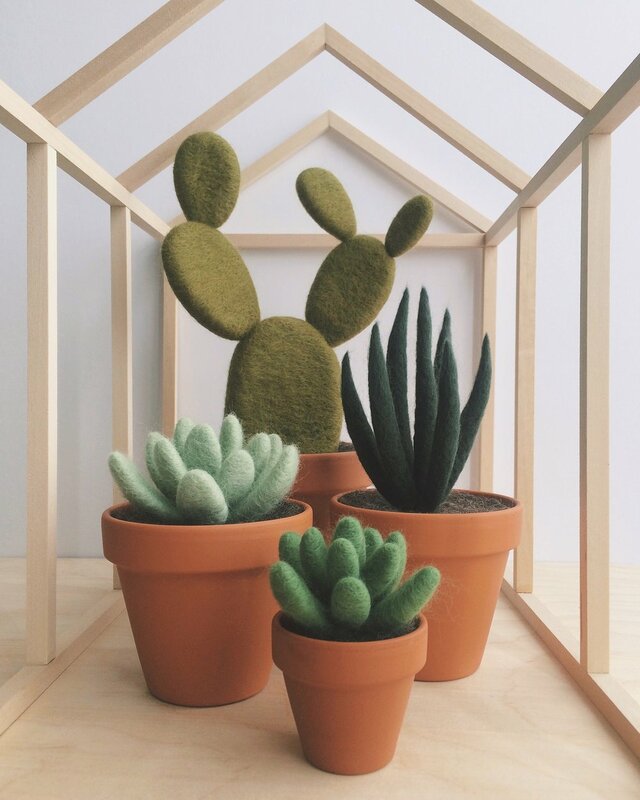 Are you just a lover of plants in general? Is that where the idea came from? Yeah. [Laughs] Plants were all over Instagram. I mean, for art school, there has to be some sort of back up to why you're making what you're making. [Laughs] I guess you can't just be like, "This is my work and there's no reason behind it." Yeah. [Laughs] There has to be some sort of explanation and research behind it. So I did a lot of research on the colour green, and plants, and how it's good for your mental health. Did Contrabotanic just take off after Summer Company? I mean, the program was really short, it was just three months. I didn't do any pop-ups or make any sales during the program. I don't think there were many opportunities around the time that I was getting started. I spent a lot of time designing business cards, making my website, pricing things out, and all the little starter things. I think the first show that I did was a month after that program. It was Etsy Made in Canada. It was like their first version of that. I think it's been going on for a couple years now. But yeah, it was an Etsy show at OCAD. So I just applied for that and it went really well. Then I kinda just started doing more shows after that. You kinda make small commitments to doing things. Like during the show, people ask you what you'll be doing afterwards, so you're like, okay, I'll be doing another show. Or make more and put it up on my website. It's just something that continues to happen. I think it's just something that developed naturally. A lot of the opportunities that I got were through Instagram. Crown Flora found me through there and they were looking to introduce more product. Yeah, so they thought that Contrabotanic was super fitting to throw in there, so yeah, they approached me about it and they were my first retailer ever which is super nice. Do you think having a certain aesthetic on Instagram is necessary for creative businesses? I think so. You do build a sort of like, an essence and brand that people remember, so when you post something new, people recognize it. It does feel weird to think about, posting to Instagram, when you start to think of it as more of a business thing. I find it sort of strange. But I do enjoy doing that kind of stuff. I enjoy taking photos, curating, and branding. What else are you working on aside from Contrabotanic? I just started a new job at an interior design firm about three weeks ago. I'm working on the textiles part and sometimes ceramics or tableware, which is also a passion of mine. I really love ceramics. I really wanna take a ceramics class. You should! It's really fun. I would really love to do my own ceramics for Contrabotanic. Do you see Contrabotanic as something that you'll be working on full-time in the future? Maybe. I don't know. Right now, because I just graduated, I'm still kind of like, feeling out what sort of direction I want to go to. I do wanna have the experience of working for an established company. I'm kind of in between things right now, but it doesn't mean that I have to give up one of them. I can do both. How long does it take for you to prepare for a show? I like to give myself a month to work solely on building enough product because it's very time consuming. Do you have any shows coming up soon? I don't have anything booked right now, but I do have a couple dream shows that I would like to do eventually. I really wanna do City of Craft. It's like this 3-day thing around Christmas time. I would love to do that. There's a lot of variety, but it's also very curated, and all my top vendors are there. I've always enjoyed going there as a customer. Who are your top vendors? Oh man. Uhm.. [Laughs] There's so many people that I look up to. Contour & Co has really amazing handmade leather goods. Corey Moranis is good too. She was actually in my program but she didn't complete it because her business really took off. It's all nice handmade stuff so I feel like it has more sentimental value when you give it to someone. That's really cool. I'll definitely have to check out City of Craft. Okay, last question. Do you have any advice for emerging artists? I definitely learned a lot by doing. I know I spent a lot of time at OCAD, like, six years is a really long time but I don't regret spending that time there. Even when I was in Illustration. I learned what I like and didn't like by doing. So I guess my advice would be to just do it. Don't put a lot of pressure on yourself. Just try things out, and if you don't like it, try something else.